Replacement commode pail for use with Invacare® commodes: • All-in-One Aluminum Commode (#96504) • I-Class All-in-One Commode (#96301, 96304) • Safeguard Steel Commode (#96104) • Drop-arm Commode (#9669). Treated with Microban® antimicrobial protection to resist the growth of mold, mildew, and bacteria. 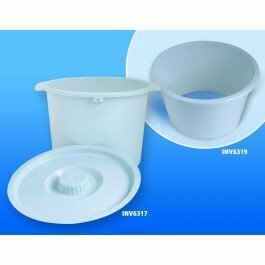 The pail & lid is used when the commode is placed at the bedside.12 Quart Capacity. View More In Bedside Commodes.